The 1950s were heady times for American automobile stylists, with bold, sometimes even outrageous designs appearing every year for a given model. Corvette stylists got a break however, with a new design required only once every two years. 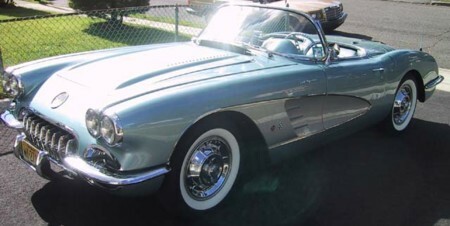 The 1958 Corvette was redesigned mostly in the front, with the most distinguishing feature being the four headlights. Popular for the era, they were emphasized by a long chrome trim piece that ran the length of the fender. The new style, credited to Harley Earl, had a more aggressive, almost mean look to it. It was also physically larger, increasing width by 2.3" (to 72.8") and length by 9.2" to 177.2". Also up was the weight, by approximately 100 lbs., with a corresponding performance penalty. Radius rods were added to the rear suspension, which cured some behavioral problems under hard acceleration. All the instruments (except the clock) were placed in front of the driver, allowing him/her to use them while still paying attention to the important business: driving. Most prominent was the all-important 6,000 RPM* tachometer. The refined layout drew rave reviews from buyers. The center console housed the clock, heater controls and optional radio. *270 hp, 290 hp engine tachometers read to 8,000 RPM. Below: A "grab bar" was installed for the benefit of the passenger, which was probably often appreciated considering the Corvette's performance potential. Detractors referred to it as the "sissy bar". 1958 Corvette hood, with non-functional louvres. It was affectionately known as the "washboard hood". The trunk featured two spears (nicknamed "suspenders") that ran the length of the panel. Both items identify the cars as 1958 Corvettes as they were not used on any other year. The 1958 grill was similar to the previous five years, except that the number of vertical bars went from 13 to nine. The two grill areas to the sides may appear to be ducting cool air to the brakes, but were actually blocked off.